We have been cooking Kaapse Moskonfyt on the farm for 15 years. It all started when I received an antique jar with the Dutch words “Kaapsche Mostkonfijt” engraved on it… this jar was the inspiration behind our Moskonfyt! 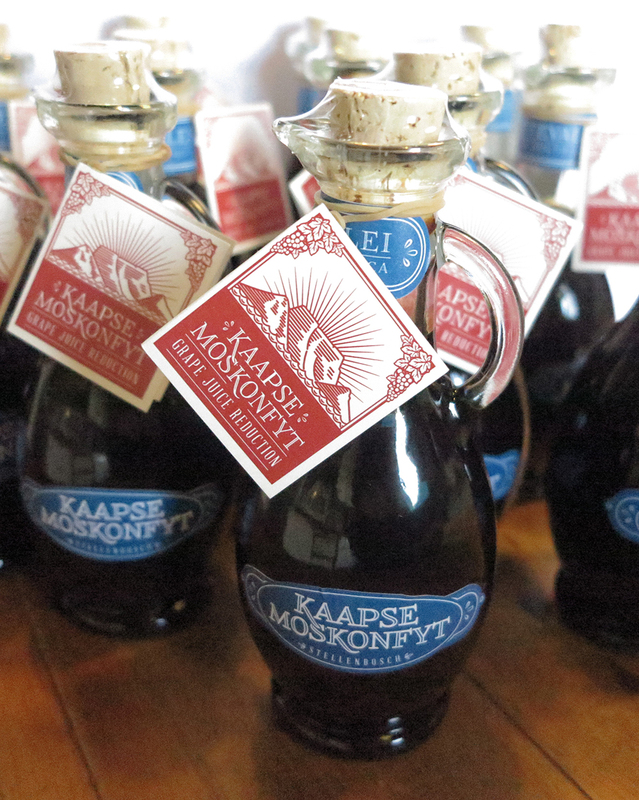 Moskonfyt basically is a reduction of clean, fermenting grape must, it is a traditional syrup from the Western Cape, but it is found in every wine producing country around the Mediterranean Sea. In Turkey a spoonful of this “melasse” is fed to school children every morning to provide them with many antioxidants and healthy nutrients for their day. In Burgundy it is called “raisiné”, in Italy “sapa”. The art of moskonfyt dates back to the days of Julius Caesar, ancient recipes have been discovered that explain the art of reducing grape juice. Few people still cook authentic moskonfyt in South Africa, it being extremely time-consuming and labour intensive. It is also season bound – cooked from clean, fermenting grape juice only during harvest time in the Cape, February and March. We cook in the traditional way, outside over open wood fires. Wood is harvested from alien blue gum trees on the farm. No sugar or preservatives are added. Enjoy your syrup over freshly baked bread or croissants. For an unforgettable breakfast and something different, halve and warm your croissants. Fry some bacon in a frying pan and add some moskonfyt to the bacon when it is cooked. Drape the bacon over the croissants and add the juices from the pan! Use as glaze for gammon. Drizzled over braaied snoek, it gives a beautiful sheen and brown colour to the fish. Vinaigrette: Next time when you prepare your own balsamic vinaigrette, replace the honey/sugar with some moskonfyt. The moskonfyt complements the balsamic vinegar wonderfully and brings out the fruity taste of the balsamic. The best sweet potatoes ever! Peel and quarter the sweet potatoes. Cook them in water until almost done. Drain. Heat some oil/butter in a pan and fry your sweet potatoes in the oil until crisp. When fully cooked, drizzle some moskonfyt syrup over them and fry for a few minutes more. As a sambal served with venison: Chop up a red chilli together with a sweet red pepper. Mix in some moskonfyt and serve with venison as a relish. * See Press for more moskonfyt recipes.